The Canadian Centre for Occupational Health and Safety (COHS) is the official government agency responsible for the workplace. Federal regulations were last updated in 2007 with Part XIX of the COHS call on employers to incorporate ergonomic-related hazards responsible for the development of MSDs into their legally mandated workplace Hazard Prevention Program. 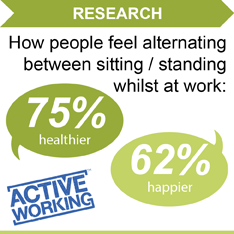 Typically the act of sitting is rarely viewed as a health and safety concern. When it is considered the link is limited to Musculoskeletal Disorders (or MSDs) meaning injuries and disorders that affect the human body's movement or musculoskeletal system (i.e. muscles, tendons, ligaments, nerves, discs, blood vessels). Among provincial jurisdictions British Columbia has the most comprehensive ergonomic regulations. It requires employers to consult joint health and safety committee members and affected workers in identifying, assessing and controlling the risks associated with the development of musculoskeletal injuries. The province of Ontario recommends that computer users take a 5-minute break every hour. This is a requirement for organizations governed by the Regulation for Health Care and Residential Facilities, and considered a best practice in other organizations. 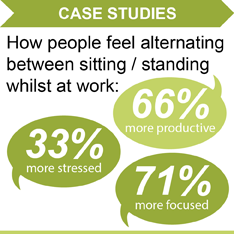 Get Canada Standing believes both federal and provincial guidelines relating to prolonged and excessive sitting (in the office environment) be significantly updated and go considerably further. "Regardless of how good your working posture is, working in the same posture or sitting still for prolonged periods is not healthy".